I love those days when simple box of birthday supplies turns into something magical. My Boy has quite the imagination. Immediately after taking all of DQ's party items out of the box, he begged if he could have it. You know what they say, give a kid a toy, and they'll play with the BOX it came in for hours. It's cool though. It wasn't tv, or computer, or electronic game. He drew a control panel. He made weird-but-cool beeping and dooping sounds. He launched. He orbited. He landed. He dreamed. He even was sweet enough to give his little sister a ride to the moon. That was the coolest part. 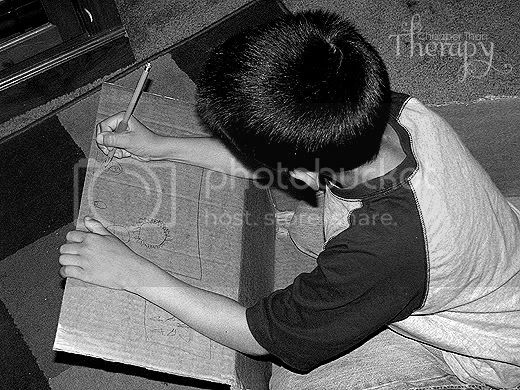 We did many a creative project with CM boxes when M was younger. Still have a 'tv' we made - it even had a VCR. How cute & what a great imagination! I love to see what my girls will come up with, when they get a new box. Just the other day, I got a new vacuum & they played with the box it came in, for hours. It was a "partment" for their stuffed animals. You have got the most adorable children - ever! Isn't it exciting to see a child use their imagination? Awesome! Those are the moments you never want to forget. um...how have I never come across your blog before? What a lovely lady you are! Good luck in the 5 Minutes contest. Isn't it great to see them so creative? Love that last picture! This is why the cardboard box is now inducted into the toy hall of fame. I love that he took his sister. When this kind of thing happens I know know that somewhere in that magic mojo mess that is my parenting style I must be doing something extra specially right. 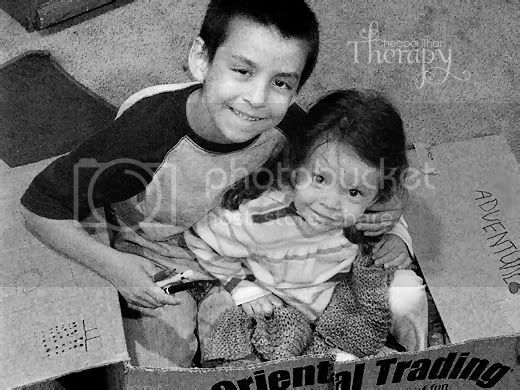 Boys and boxes how fun. I just took a photo of my little guy in box that I was going to post about this week. I swear, the day I come home from Costco he can entertain himself for hours. It is always the box! I love it! That really is cool! Wouldn't it be great if we kept that kind of imagination our whole lives. Priceless. My daughter (9) will still play with a box that size for hours. Too awesome! Kids imaginations are the best. If only we could hold on to some of that creative magic for just a little longer! I have lost all my creativity it seems. A box is a box to me...but this weekend while I was getting the trash ready, the kids were freaking out b/c I was breaking the boxes down to throw them away! LOL! I told them they had like a bagillion toys and that they didnt' need the boxes...but I eventually gave in. I'm giving them boxes for christmas. HAHA! that is so friggin' cute! Bubby is already starting. he LOVES boxes! he loves to be in them, on them, under them, it doesn't matter. and i love watching. That is the best part! what a cute picture & story! He has a great imagination, doesn't he? I love it! That last picture is so sweet! moments like these are the best! What a good big brother he is to give K a ride to the moon, hope she gave him gas money, or at least a kiss! I went to a 4-year-old birthday party about a month ago and the main activity they had going was making HUGE cardboard boxes into rockets ships (and this was girl party too!) and the kids LOVED IT! It was the simplest best idea ever for party and at the end when all was said and done, they gathered in the boxes together and took off for an incredible adventure into the galaxy. Boxes simply rule. Thanks for sharing! My daughter claims every box that comes through our door. Once we even made a complete house out of a lawn furniture box. It was awesome. We had curtains & painted the whole thing. It even had clothespins glued inside for art work. I think I loved it as much as she did. I gave my then 11 year old the box the t.v. came in and he slept in it for a week! Kids are sooo much fun sometimes. that's awesome! i love kids who have a wonderful imagination :) and i'm even more proud it wasn't a computer! i was so disappointed in the school where my son goes when they had to build a laptop out of a box... really!? Thats awesome! I hope they enjoyed the moon. Kids only need a box or a blanket over some chairs for a tent and they are happy! 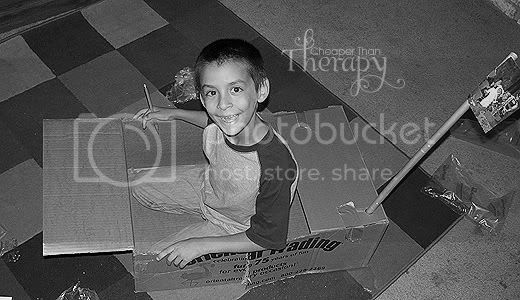 I loved playing with boxes, blankets, and sleeping bags as a kid. They make for great cocoons, forts, cars, and anything else you can think of!!! Adorable! My girls love to make forts by putting blankets over all the furniture. Awww -- I LOVED big boxes when I was a kid. They are the best. That's awesome! I love it when my kids do stuff like that! What an imagination! And he shared with his sister!!!! What a sweet sweet boy! He is so cute!! And creative! In our case Isabella loves empty diet coke boxes or laundry baskets. Shoot, toys are so overrated! Don't you just love creative children. And think about all the $$ we spend of toys. LOL! I LOVE it...what a smart kid! 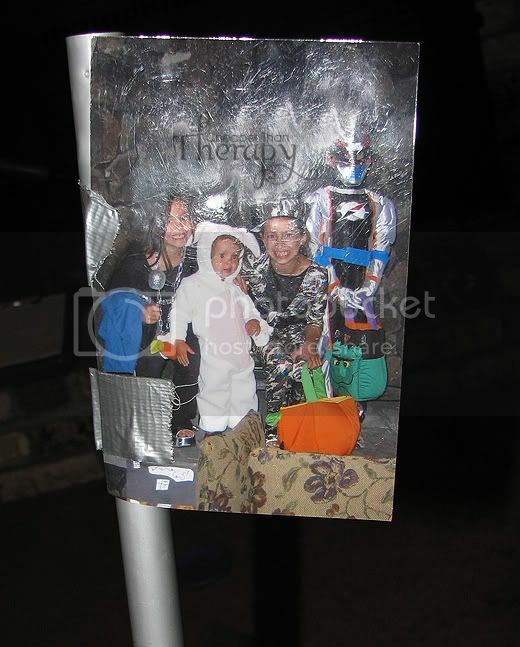 And the pictures are great! How cool he is growing into a little man and well on his way to doing huge things. Kids have such wonderful imaginations don't they?? So cool to have that imagination. Now give him Duct Tape for Christmas...in several colors...cheaper than therapy and cheaper than Santa! 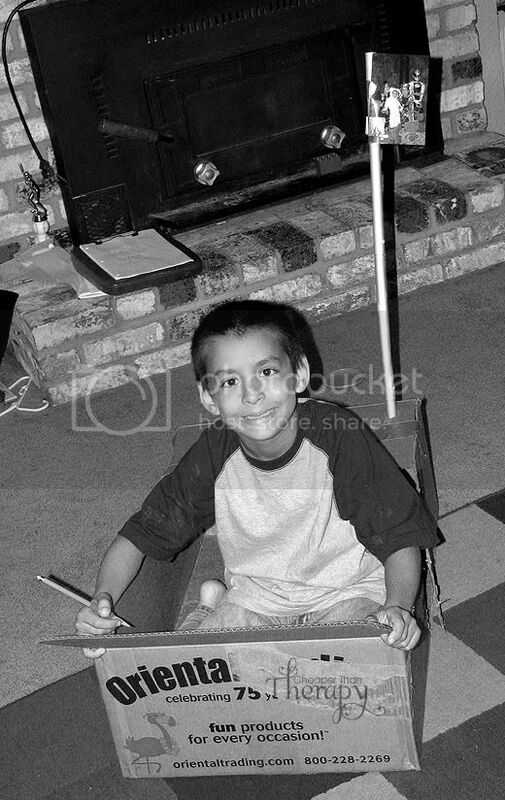 The box was always the best part of any present my kids got. Maybe this year with times so financially difficult, parents could give a box with markers and such AS the present! Kids have the best imaginations. Love that you captured his. Your son has "Super Hero" potential. What a guy!!!! I love it when my kids are creative like that! Cute photos, BTW! Oh, that is too cute. We're into boxes here, too, but not quite into making them into things. What a creative little guy!!! My kids are the same way...they'd rather play with the box that the toy came in! What a great post! Your children are dolls! :) Thanks for sharing this. Cheap thrills; those are the best. So precious-that 'ride to the moon' bit at the end practically brought me to tears. So sweet. I love seeing kids be creative! It's no small feat to get them to step away from the computer/Wii/Gameboy/etc. these days. Boy, I'm starting to sound old! But I totally remember when we just had to be creative-none of that stuff was even around! So true...they only want the freakin boxes!